I will survive, but I'm not in the right frame of mind to write detailed info about cheap fun. Besides the stuff below, there is a Civil War film at the BPL; and live music at Toad, Zuzu, and Charlies Kitchen is always a decent Monday option. Unfortunately I won't be leading Cheap Thrills team tonight. I hope others go and have a good time at probably the most entertaining pub-trivia-style game I've experienced. Based on available info, tonight's game will include segments such as features "A Quick Tour Through TV Game Show History", "Public Zoo", and "Never Break the Musical Chain". If you liked Pants Yell, you should dig CUFFS that includes 2 guys from that band. 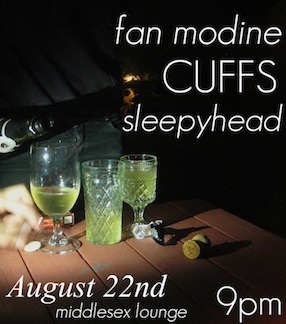 There is evn more indie-pop from the other bands as well, which should be a good show. Lots of twangy, folky tunes with a punky attitude is going down by locals Movers & Shakers and Jeff Rowe as well as visiting bands especially Austin Lucas & The Bold Party. I suggest giving him a listen.